A few of you asked about my friend Chris Witte and how her family was doing after her death. It has been two years and I know it wasn't easy, but they all seem to be coping well. Her oldest daughter, Kristin, had two young boys at the time. She also inherited the care of her sister TaylorAnn who was only 18 and a freshman in college. Kristin is expecting her third son any day now and TaylorAnn is a Junior in college and doing well. I stay connected via facebook and whenever I send a care package to my girls, I send one to TaylorAnn as well - it's no harder to send out three than two! Luckily, they have a broad extended family and a wide range of Chris' friends who were willing to adopt them for a bit, so they've had the support they need to deal with the tragedy they went through. Thanks for asking! 2004-2005 School Year highlights. For the School of Life albums. I did this page 4 times, changing out two photos and a bit of the journaling. 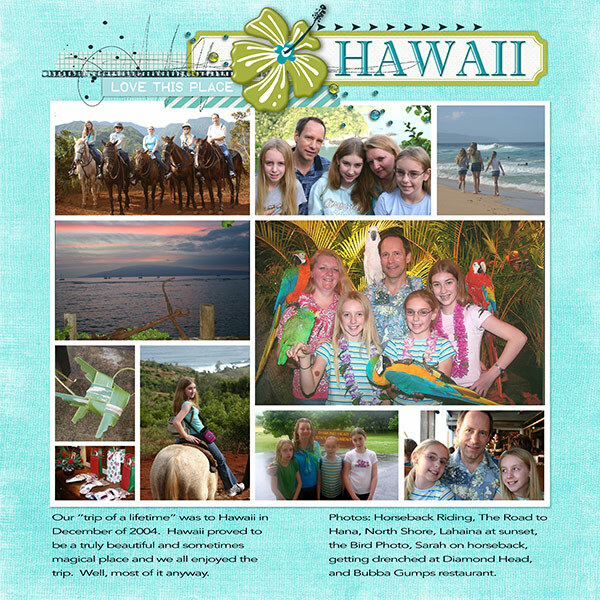 It will be printed as a page for each of the girls' School of Life albums and our family "Places We Go" album. Love it when I can make the work stretch that far! Documenting the making of beautiful smiles. 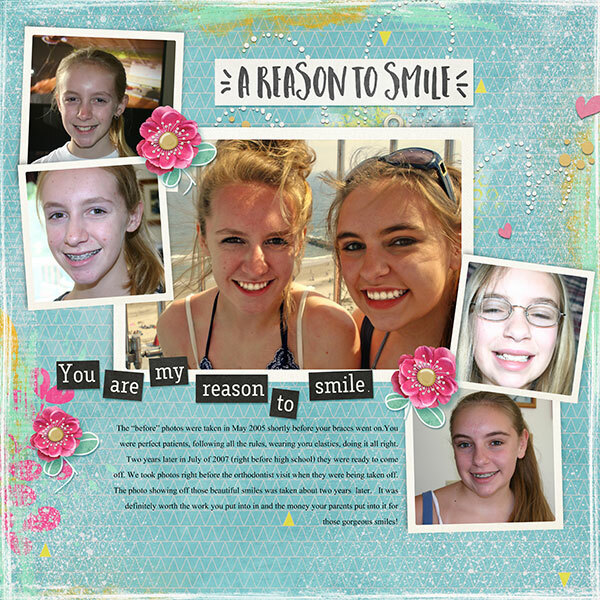 I was originally going to do a separate page for each of them, but couldn't find any photos right after the braces came off that really showed those beautiful smiles - that was the period when all my photos of them are of hands in front of their face (thank heavens they eventually outgrow that stage!) The pictures are each about 2 years apart. It is amazing to see the growth in a span of just four years! 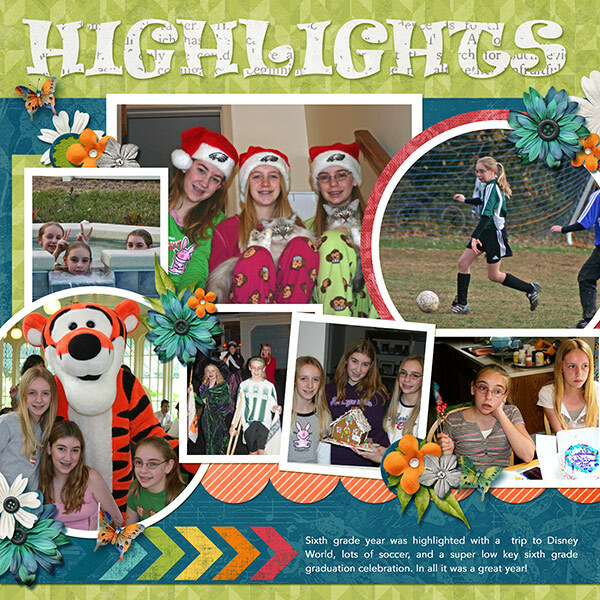 One of the clear advantages to digital scrapping is the ability to make multiple copies for different scrapbooks! My mother made multiple photo albums back in the fifties. I'm not sure who they were intended for, but in the end, my brother and I had copies of lots of the (actually infrequent) photos that were taken when we were growing up. 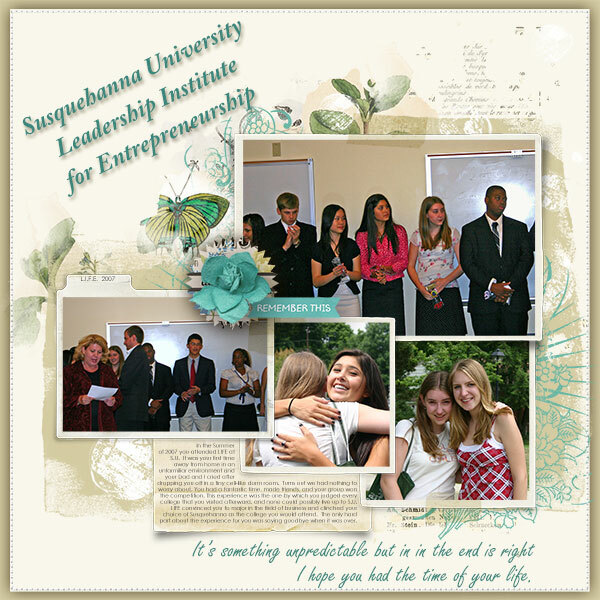 I'm grateful as I'm sure your girls will be to have copies of these lovely layouts. Yes: they're sure to appreciate the love and care that has gone into their albums. It's worth it! As usual, your pages are beautiful. I enjoy your journaling---most of the time I can make it large enough to read. I also like the little bits and pieces of your pages. I love that you put so many photos on each page. I sometimes feel like I'm the last person who does that. Wow, I like how you have so many photos on these! And great job re-making that one to use four times! I like the highlights page and the smiles - in both you can see the growth.